The group we know today as the ‘Islamic State’ only became known as such after a series of successive transformations and name changes over the course of more than a decade. One of its predecessor groups was the Islamic State of Iraq (ISI). Proclaimed in mid-October 2006 after the death of Abu Musab al-Zarqawi, and born out of al-Qaeda in Iraq (AQI), Islamic State of Iraq (hereafter ISI) would last until April 2013 when its leader Abu Bakr al-Baghdadi announced his group’s presence in neighboring Syria and changed name to Islamic State of Iraq and al-Sham, better known as ISIS. In order to examine the design and use of some of the SVBIEDs employed by ISI during a large part of its existence, this article will take a look at 11 videos released by ISI’s al-Furqan media department between 2007-2012. These videos include all 9 parts of the “Fursan Shahada” (“Knights of Martyrdom”) series, as well as the 2010 release titled “Vanquisher of the Peshmerga” and the 2012 release titled “The al-Anbar Spring”. It should be noted that although heavy and medium trucks made up the majority of shell vehicles used as SVBIEDs in the videos examined for this article, that doesn’t necessarily reflect the overall makeup of SVBIED shell vehicles employed by ISI in northern Iraq during this time period. 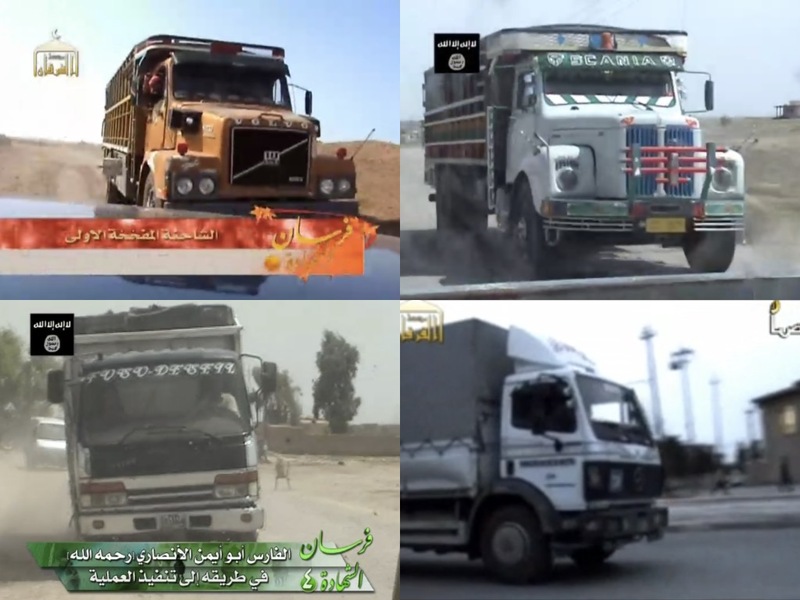 In fact, it’s very likely that these vehicle types, especially heavy trucks, are overrepresented simply because they are more likely to be used in high-profile SVBIED attacks that in turn are more likely to be videotaped and included in official ISI releases due to their increased propaganda value. Nonetheless, each shell vehicle type will be examined in greater detail below, beginning with heavy trucks. Heavy trucks, such as transport and dump trucks, made up half (13) of all SVBIED shell vehicles visible in the chosen data set. The raison d’être of this vehicle type is heavy lifting, something that makes them the optimal SVBIED shell vehicle for high-value targets. Explosive payloads of between 4-6 tons is not all too uncommon. The heavy featuring of transport and dump truck-based SVBIEDs revealed something very interesting. “While the majority of VBIEDs used during the Iraq war were ‘covert’, insurgents would sometimes use up-armored SVBIEDs with steel plates welded to the front of the vehicles. At the time I wrote that article, I was unable to locate any footage showing the design of up-armored SVBIEDs employed during the Iraq War. But, as it would turn out, more than a third (5) of all heavy trucks included in the data set for this article had been partially up-armored in order to protect the driver of the SVBIEDs. The first example was included in the first “Knights of Martyrdom” video, released in March 2007. The added armor consisted of a rectangular metal plate mounted on the interior to the windscreen, with a slat cut out for driver’s visibility. A metal rod also connected the mounted armor across the driver’s cabin to the frame of the vehicle itself, reinforcing the construction. 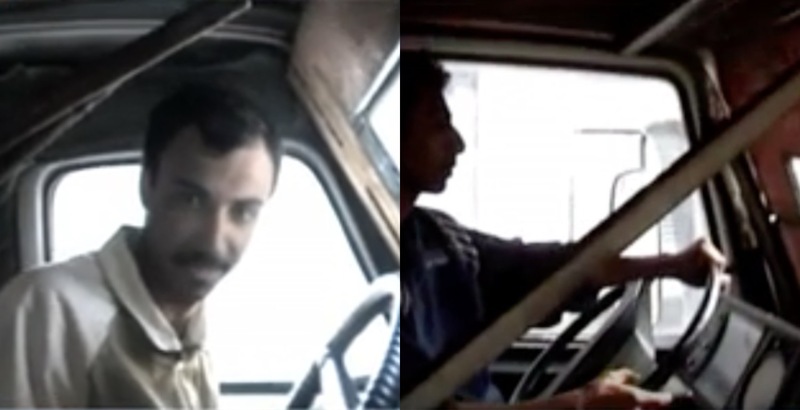 The video titled “Vanquisher of the Peshmerga”, released three years later, included two more shots of the interior of this type of partially up-armored SVBIED. Interestingly enough, the design of both featured examples in that video were identical to the first example from 2007, an indication of standardization of parts of the design and manufacturing process. Another shot from the same video release showed how the exterior of one of these partially up-armored SVBIEDs could look like. The next question that comes to mind is; how would you classify these partially up-armored SVBIEDs? I’ve written a great deal on the evolution of Islamic State SVBIED design post-2014, and what instantly comes to mind is camouflaged SVBIEDs, specifically the stage 3 camouflaged SVBIEDs that were introduced by the IS contingent in Raqqah city and its surroundings in early 2017. IS stage 3 camouflaged SVBIED witth complete interior windshield and frontal armor used against YPG east of Tabqah in April, 2017. Stage 3 camouflaged SVBIEDs were conceived by emulating the exterior visual characteristics of civilian vehicles while still maintaining a substantial degree of armor capabilities, but although the ISI heavy truck SVBIEDs with partial interior armor used a decade prior appear to have been designed with a similar thought in mind – The successive design process was completely different. The camouflaged SVBIEDs from 2016-17 were an innovation to standardized up-armored SVBIEDs necessitated by the incessant coalition air campaign, and typically included a more complete armor kit. On the other hand, the ISI heavy truck SVBIEDs with partial interior armor from 2007-2010 were a direct innovation to covert SVBIEDs. Adding interior windshield armor to a small percentage of heavy truck SVBIEDs designated for high value targets was a fairly logical design evolution, as it could potentially increase the survivability of the SVBIED driver and the overall success rate of such attacks. Because of that, I won’t refer to the partially armored ISI heavy truck SVBIEDs as ‘camouflaged SVBIEDs’, instead referring to them as ‘covert SVBIEDs with interior armor’. An interesting section of the ISI release “Knights of Martyrdom #3” was dedicated to the attack on Badoush bridge in May 2007. Three covert SVBIEDs (including two based on heavy trucks) attacked installations close to the bridge (located northwest of Mosul city), with one heavy truck SVBIED detonating on the bridge itself, collapsing sections of it and rendering it unusable. The use of (S)VBIEDs in order to attack infrastructure was actually a recurring feature of the Iraq War, with ISI frequently detonating car and truck bombs on bridges in Baghdad, Ramadi and other cities. According to ISI themselves, the Badoush bridge attack was carried out in order to limit the number of Tigris river crossings available to security forces, creating bottlenecks at remaining bridges that would be easier to target. It should also be noted that not all heavy truck (S)VBIEDs involved a suicide driver. Some were in fact a variation of parked VBIEDs. 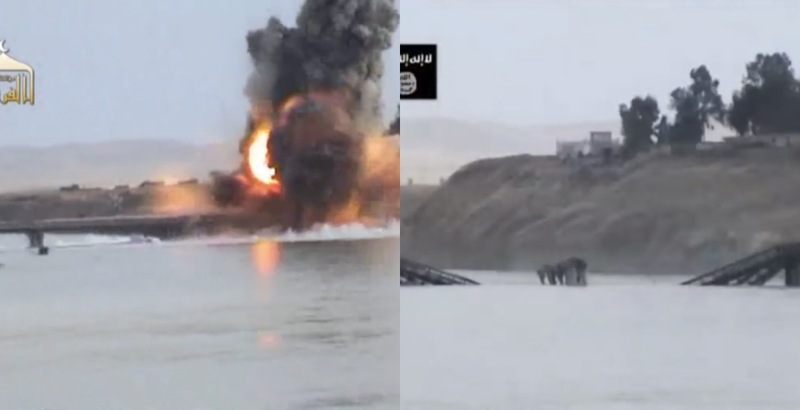 The video release “Vanquisher of the Peshmerga” featured multiple such instances. 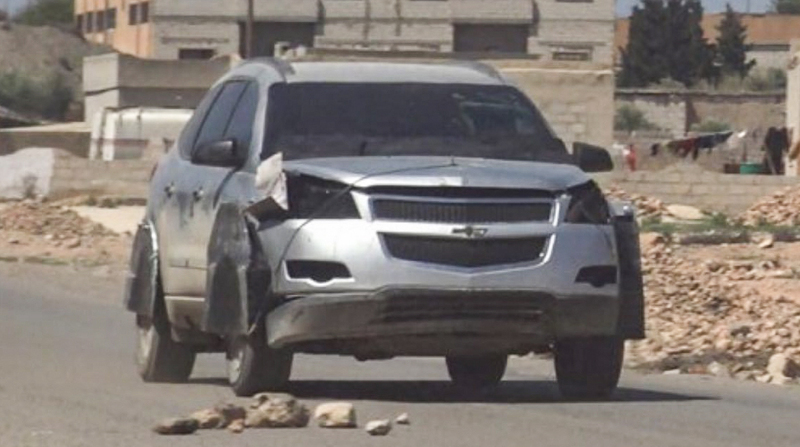 For example, an attack on a Peshmerga building in al-Tahrir district on the outskirts of eastern Mosul involved a heavy truck VBIED allegedly carrying 4 tons of explosives that was driven to and parked next to a set of concrete blast barriers adjacent to the target building. The driver then exited the vehicle and ran off while ISI fighters positioned nearby opened up fire, covering his retreat. 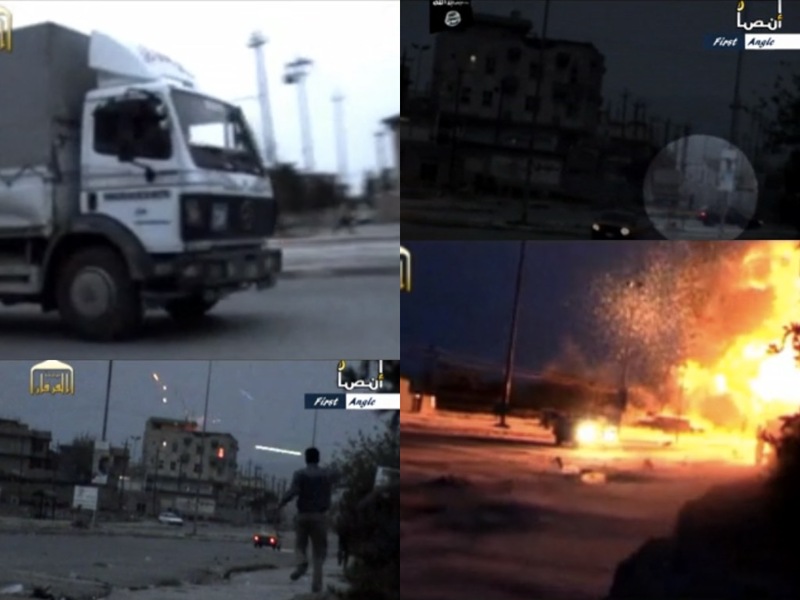 The parked heavy truck VBIED was subsequently remotely detonated. 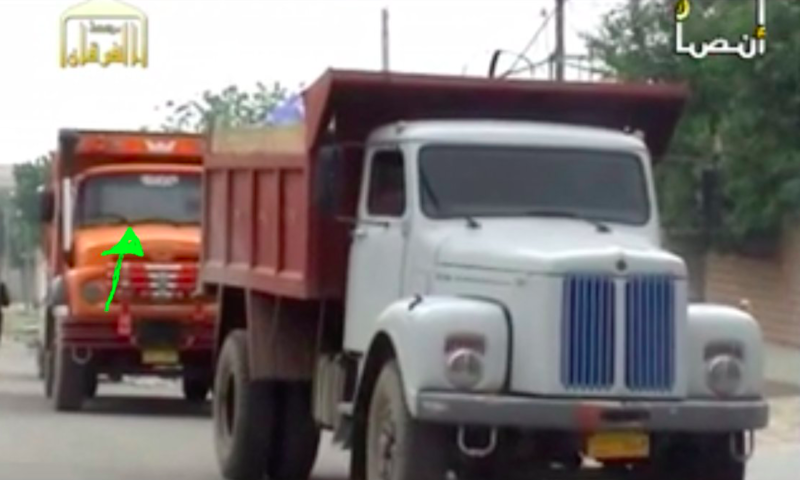 A total of 6 medium trucks, such as flatbed trucks, were included in the data set. These trucks, while smaller than their heavier counterparts, can still carry large quantities of explosives. They’re fairly common vehicles as well, and as such don’t raise as much suspicion as heavy truck SVBIEDs. Despite their heavy use of SVBIEDs, the most common type of (S)VBIED used by insurgents during the entire Iraq War was the parked VBIED. 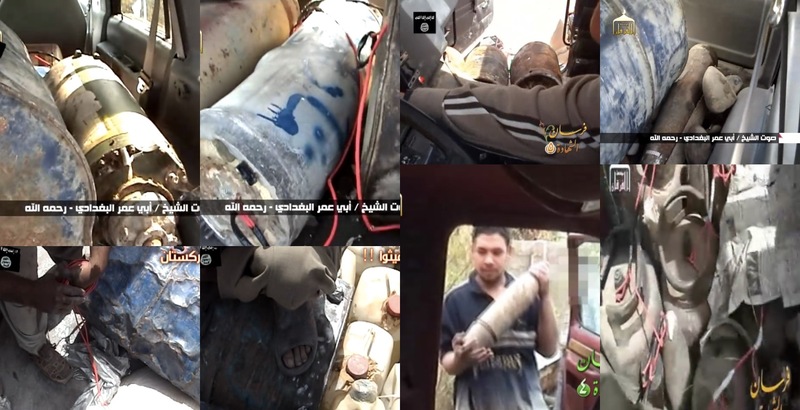 Practically functioning as larger static IEDs, parked VBIEDs would typically be left on the side of the road on routes commonly taken by their chosen targets. 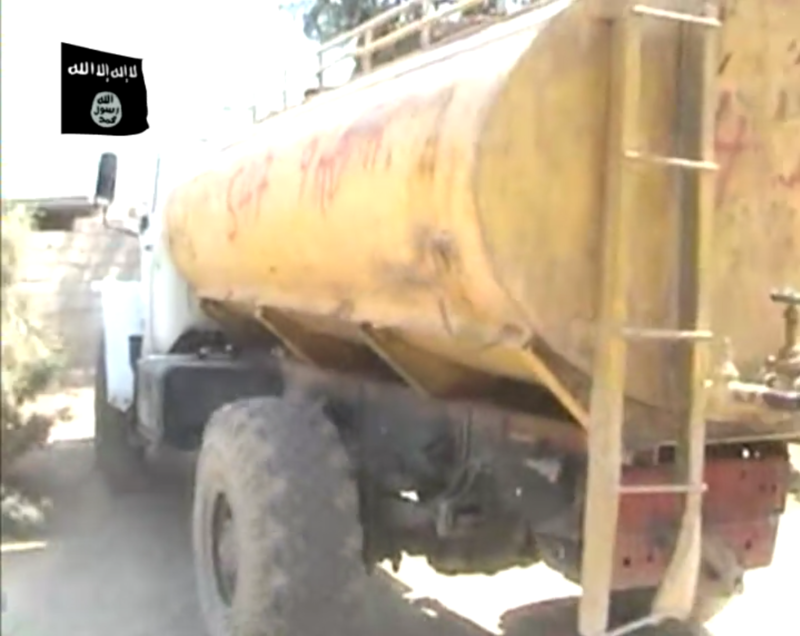 One of the flatbed trucks in this data set was employed as a parked SVBIED. With the driver still in the vehicle to avoid raising suspicion, it lurked static on the side of the highway for a bus to drive by before detonating its payload. In another attack involving the use of a flatbed truck SVBIED, ISI fighters provided cover fire for the SVBIED with small arms before it departed. Suppressive fire in conjunction with the employment of a covert SVBIED isn’t typically conducted as the successful use of the latter usually hinges on a stealthy approach, but when it is it’s typically because a firefight already has erupted or because the target expects an SVBIED to be used. Sedans, SUVs, as well as other types of normal civilian vehicles constituted 5 out of the 26 SVBIED shell vehicles in the data set. As was mentioned previously, this type of shell vehicle was likely the most common out of all during the entirety of the Iraq war due to its prevalence, but not as commonly showcased in videos seeking to highlight SVBIED attacks on high-value targets. 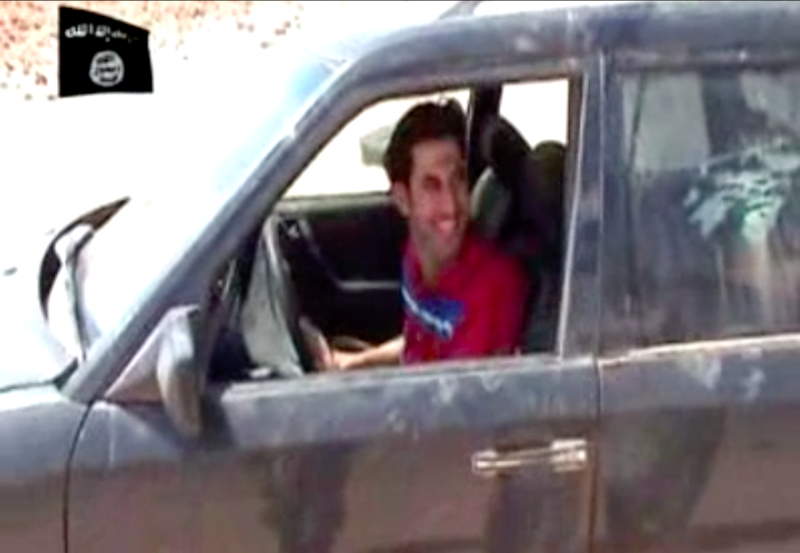 It’s quite common for SVBIED drivers to shave their beards and wear civilian clothes when conducting attacks in order to not raise any suspicions, but especially so when the shell vehicle is a civilian car where the driver sits closer to the road and is particularly visible to soldiers and guards manning checkpoints and protecting targets. 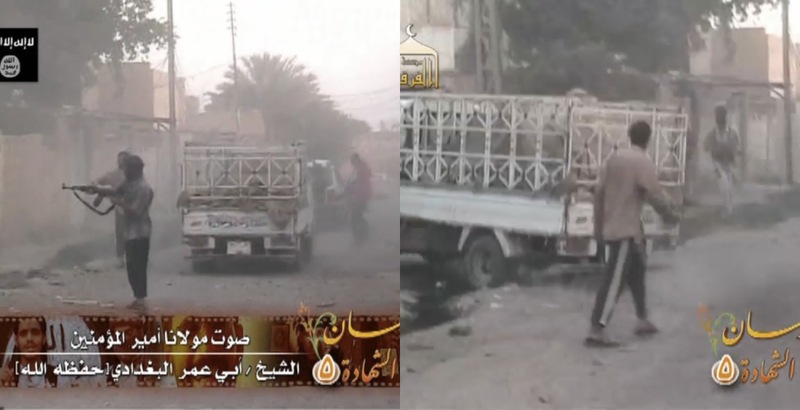 In one of the SVBIED attacks in the data set that involved the use of a civilian car, fellow fighters dressed in civilian clothes lingering near the target (an American outpost) hurriedly rushed out into the street, dragging debris out of the way in order to clear the way for the SVBIED that turned the corner moments later, simultaneously signaling to nearby civilians that it was time to move out of the area. Fuel tanker trucks were the smallest shell vehicle category of this data set, making up only two of the recorded SVBIEDs. Practically speaking, fuel tanker trucks belong to the same category as heavy trucks, seeing as the standard fuel tanker truck doesn’t vary much in carrying capacity – but I chose to award them with their own category due to reasons that you’ll likely agree with me for. While their stated role is transporting fuel, the overwhelming majority of fuel tanker trucks used as SVBIEDs are empty, instead filled to the brim with explosives in the tank. An exception to that rule was featured in the fourth instance of the “Knights of Martyrdom” series. A massive fuel tanker truck, allegedly filled with 36,000 liters of gasoline on top of a sizable explosive payload, was used in an impressively hellish attack on a military base near Muqdadiyah in northern Diyala. While the initial detonation of the explosive payload was comparatively small, it ignited the massive amounts of fuel that instantly expanded into an enormous fiery mushroom cloud that engulfed parts of the military base. Whether or not that payload mixture was more effective than one exclusively comprised of explosives is difficult to say, but it brings to mind another tactics sometimes employed by ISI and its predecessor during the Iraq War. In order to combat the use of heavy truck SVBIEDs in Iraqi city centers, many checkpoints and restrictions on which vehicle types were allowed into city centers were put in place. In an effort to bypass those restrictions, ISI and its predecessor would sometimes resort to diabolically ingenious plans. For example, in July 2005 a lone AQI fighter wearing a suicide belt approached a civilian fuel tanker delivering fuel to a gas station near a market in the city of Hilla, detonating his charge and the fuel tanker with it – burning dozens to death. The makeup of the explosive payloads for the SVBIEDs featured in the data set was fairly standard for its time, with no real standardized design to most of them. The majority of payloads involved a mix of daisy-chained artillery shells, unexploded ordnance, as well as jugs/barrels filled with explosives and cylindrical metal pipe IEDs. The detonation mechanisms that were featured in the data set were the standard devices for their time, but still more complex than what most probably believe. 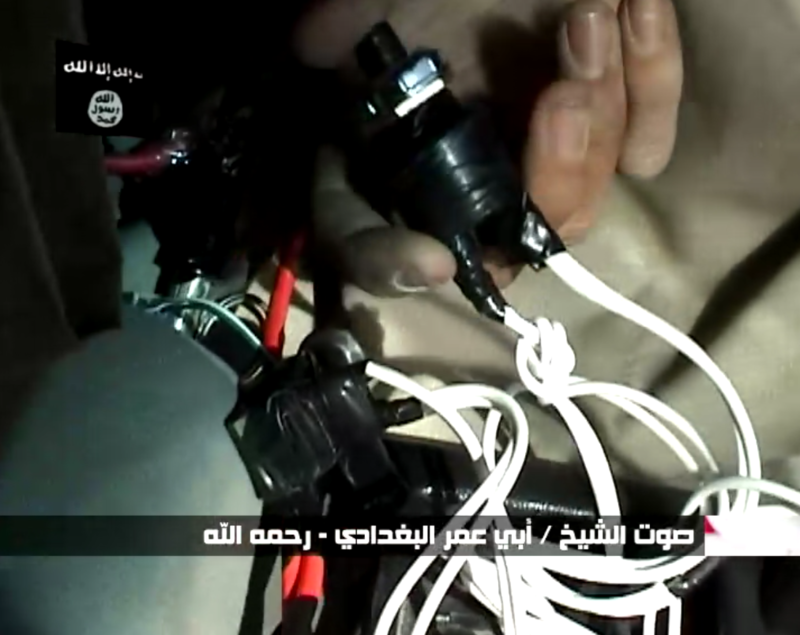 The detonation mechanism of one of the flatbed truck SVBIEDs included a safety in the form of a button that needed to be pulled before priming the commonly used firing switch based on a grenade fuze. This design is a common feature on many SVBIEDs, as the grenade fuze mechanism functions as a dead man’s switch once the pin is pulled, only detonating after the driver lets go of the lever. 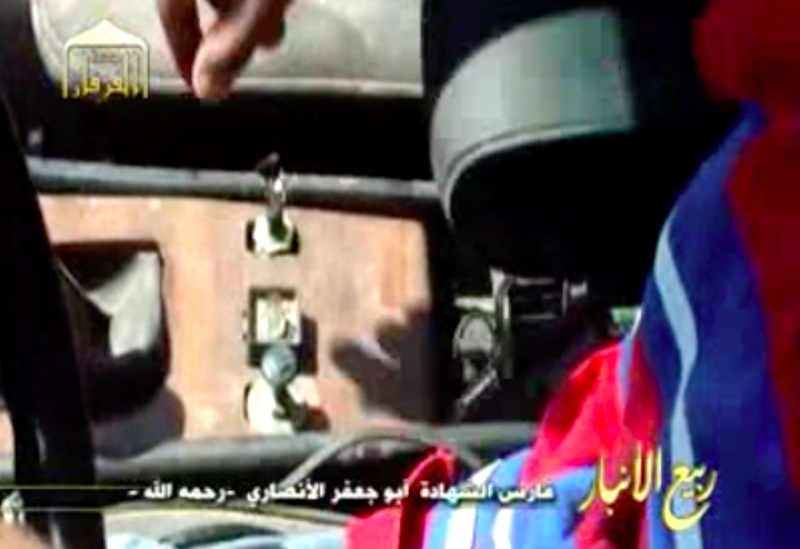 Another detonation mechanism fitted to an SUV-based SVBIED featured the use of two simple button firing switches run on separate firing circuits. 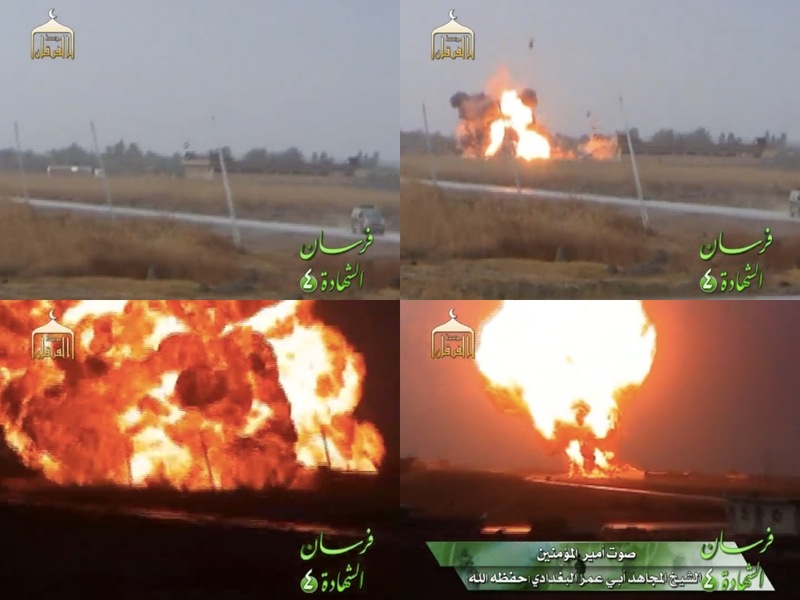 A third and more refined detonation mechanism was seen in an SVBIED based on an SUV that was featured in the 2012 video release titled “The al-Anbar Spring”. It included a safety as well as two firing switches on separate circuits, with a panel covering the wiring. Similar detonation mechanisms as the one above have actually been employed many years before, such as this one used by al-Qaeda in Saudi Arabia back in 2006. 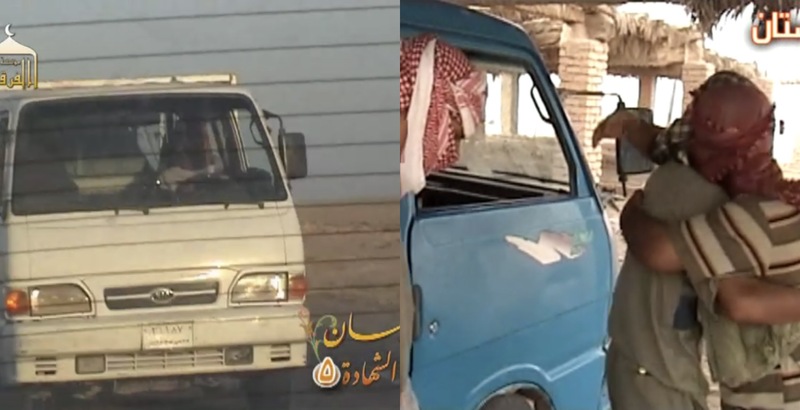 For a more detailed read on al-Qaeda in Saudi Arabia’s early use of SVBIEDs, see this article: The early SVBIEDs of al-Qaeda in Saudi Arabia (2003-2006). SVBIED detonation mechanisms actually haven’t changed that much design-wise since the early 2000s, the major improvement since then being more refined and standardized designs as well an increase in the use of multiple redundancies.